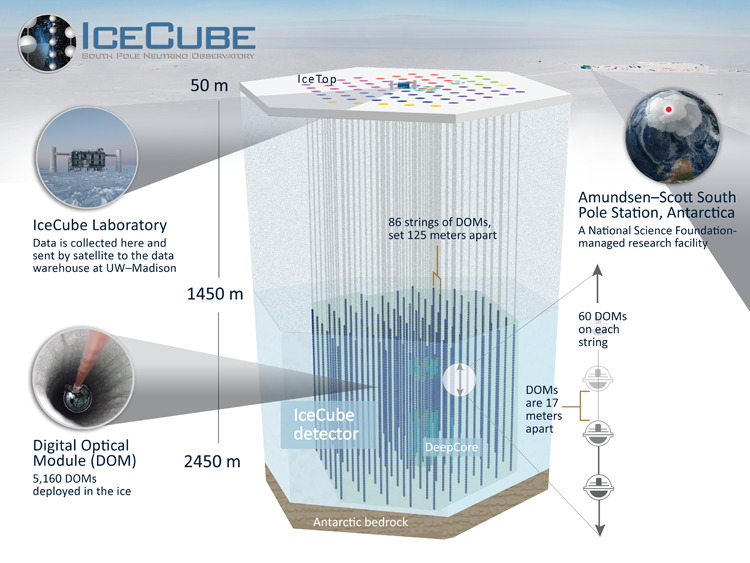 Re: Can we see neutrinos from ... ? Since neutrinos are nearly impossible to detect how can the origin (the direction they come from) of the very few that are detected be determined? Last edited by BDanielMayfield on Fri Apr 14, 2017 7:33 pm, edited 1 time in total. BDanielMayfield wrote: Since neutrinos are nearly impossible to detect how can origin (the direction they come from) of the very few that are detected be determined? When neutrinos are associated with a transient or intermittent source, the signal rises above the background rate. If you have two or more widely separated detectors, you can correlate those peaks (looking at arrival time) and determine a direction. In the case of steady sources which add to the background, you can statistically correlate all arrival times at one station with those from another and identify source directions. BDanielMayfield wrote: Since neutrinos are nearly impossible to detect how can [the] origin (the direction they come from) of the very few that are detected be determined? When neutrinos are associated with a transient or intermittent source, the signal rises above the background rate. Yes, as when a spike in detection corresponds with a SN blast. If you have two or more widely separated detectors, you can correlate those peaks (looking at arrival time) and determine a direction. In the case of steady sources which add to the background, you can statistically correlate all arrival times at one station with those from another and identify source directions. Scientific papers are a bit like buses. Sometimes you wait for ages waiting for one to take you where you want to go, then – surprise, surprise – two come along at once. This is, of course, a fundamental physical law, to which even astrophysicists are not immune. The mass of spiral galaxies is mainly distributed in three components: the classical bulge (ClB), disc, and surrounding dark matter halo. Classical bulges are the central building blocks of many early-type spiral galaxies (see the Astrobites Guide to Galaxy Types). These bulges might have formed as a result of collisions between galaxies in the early universe or various other processes mentioned in this paper. It is believed that initially the motion of stars in ClBs is disordered, so the ClB does not rotate. The authors of this paper see an interesting problem to ponder: in the present day, there is an observed net rotation of stars in classical bulges. The origin of this rotation is still to be understood in detail. That might seem like an obvious statement, but it’s one of the observations that drives today’s paper. It’s a provocative piece of work by Fergus Simpson, which attempts to understand – robustly and with Bayesian statistics – what we can infer about potential aliens based on the data point that is us. Given that we exist, and our planet is like this, can we infer anything about other planets that host intelligent life? This Bayes primer might be useful if you’re not familiar with the concept. Simpson is responsible for the Big Alien Theory, where he predicts that aliens typically live on planets smaller than Earth and weigh around 300kg. For more on that, see the paper and his website explaining the idea. It is simply astronomical, everything in astronomy: there are too many objects, everything happens on mega glacial time scale over mega glacial distance, space is too big, and objects are almost always certainly too faint. With our finite resources and human lifetimes, it is impossible to observe everything and to follow their evolution religiously from the beginning to the end. However, (super)computers have endowed astronomers with divine powers, allowing us to manipulate the Universe at our fingertips. In the absence of data, they are also the next favorite playgrounds to put theories to the test. Simulations have become the bread and butter of astronomical research. A general-purpose space telescope like HST is good at making sensitive optical observations, but the restricted fields-of-view and the high competition for observing time make them unsuitable for large-scale surveys. But Gilliland et al. had an idea: why not harness the sensitivity of HST to observe a dense globular cluster, where thousands of stars are packed together in the field of view? The proposal was accepted. In July 1999, Gilliland et al. burned through 120 HST orbits to stare at the 120-light-year-distant cluster 47 Tucanae for 8.3 days. They monitored a field of 34,000 stars in a pioneering observation which today remains the deepest exoplanet transit survey of any globular cluster. Know what they found, aside from some variable stars? Today’s paper presents how rapidly the material making up a comet swiftly evolves from its pristine subsurface form to a dark, dehydrated state, showing that a pristine interior could be hidden under an evolved and altered surface of comets such as 67P for billions of years. In addition to shedding light on the processes that shape comets, the results of today’s paper would significantly aid future assessment of the composition as well as morphology of other small bodies, and their ties to the composition and dynamics within the early Solar system. Let’s start with a short, back-of-the-envelope (back-of-the-blog-post?) calculation. Roughly 50 new astronomy papers appear on the arXiv every day. A typical paper is 10 pages long, with (conservatively) 500 words per page. The average human reads 250 words per minute. The argument is flawed. You don't keep up with astronomy (or any scientific field) by reading papers. You keep up with your personal area of specialization by reading papers. If you're interested in other areas of science, you keep up by reading summaries of research. Only occasionally would you actually go to a source paper for something outside your own area of expertise.